A female, middle eastern, terrorist is captured by the CIA in Greece after an attack on a marketplace. Transported back to the USA, the terrorist undergoes an operation where she is transformed into a cybernetic killing machine. Now the CIA have a secret weapon to send back to the Middle East, but how long can they control her? In short, The Retaliator is an average movie – at best. The basic plot has the American government capture a Middle Eastern terrorist (Sandahl Bergman) named Samira – and do experiments on her. The experiments lie somewhere between The Six Million Dollar Man and Frankenstein. They make her into a cyborg, replacing her “frontal lobe with circuitry.” Seriously. So she now supposedly has no personality, retains her skills, and becomes the perfect assassin. Until she gets her memory back and goes on a roaring rampage of revenge. 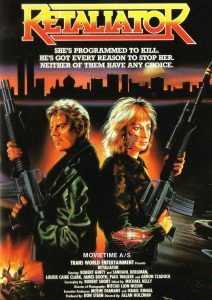 She starts killing the various people who were involved in her transformation, leaving the agent who captured her (Robert Ginty) for last. The agent has his own problems. He’s been cut loose by the CIA, his wife wants him to retire so that they can have a normal life. But Samira has other plans. The acting’s average, the pace is slow, it’s rated R, and the movie’s average at best. I rate The Retaliator 2 stars out of 5. Sandahl Bergman, Red Sonja – the evil terrorist Samira. She becomes a puppet cyborg, who goes on a revenge mission against the people who did this to her.